Retrieve the infamous sword Umbra from a regretful killer. Present Clavicus Vile with 500 gold once you reach level 20. Clavicus will tell you that he wants the sword containing the soul of the warrior Umbra. Retrieve the Umbra sword from the Bosmer, Umbra, located in the Ayleid ruin Vindasel. Note: Umbra may be killed, and the sword retrieved, at any level, and even before initiating the quest. Once Umbra is dead and the sword is in your possession, speak with Clavicus Vile. Return to the shrine for your reward, the Masque of Clavicus Vile. Alternatively, you can refuse to give Umbra to Clavicus Vile, and you get to keep the sword as your reward. The shrine is located in the West Weald, a bit off the east of the Gold Road as it travels south, near Lake Rumare, and between Fort Virtue and the Ayleid ruin, Ceyatatar. You must find the shrine on your own; no one will tell you where it is. A mortal! Wonderful. Always a pleasure. Perhaps you'll do a service for me, mortal. And I'll reward you. A fair bargain, don't you think? You will retrieve for me a sword, a very special sword. It contains the soul of Umbra, a hero I have had dealings with in the past. Bring the sword to me, and I'll reward you with my Masque. You'll not find a better bargain, mortal. Begin your search in Pell's Gate. Hello? Hey! Pay attention! In your pack. The dog. I swear, you heroes aren't particularly quick on the uptake.... Good. Got your attention. I'm Barbas, the Hound of Clavicus Vile. Not that I've always been a hound, or always been called Barbas. I've also been a Redguard. For a while I was a scamp, making deals with Orcs. But, for now, I am His Hound, and I serve the Lord Clavicus. A word of advice here. You've made a bad deal. This Umbra -- bad business. Things always end badly where that one's concerned. Clavicus has always been a little blind to that. And it'll end badly this time, too. So, just leave things be. Walk away. It's your best bet, really. Clavicus Vile initially directs you to ask about Umbra in Pell's Gate, which is a short distance east of the shrine south of the Red Ring Road. The most knowledgeable villager in Pell's Gate is Irroke the Wide, to whom Umbra, formerly called Lenwin, had been apprenticed. You learn that Lenwin had found the sword Umbra, and went on a murdering rampage because Umbra (probably the sword) hungered for souls. Irroke directs you to the nearby Ayleid ruin, Vindasel, to start your search. Vindasel is easy to find if you follow the Red Ring Road west from the village. This is your out, friend. Leave it alone. How about we just march on back to the shrine and tell Clavicus the deal is off? Sure, he'll be a bit put off, but you won't be dead. At least, you probably won't. That's better odds than you're getting here. Good move, kid. Some things are better left alone. Let's get back to the Shrine. I'll smooth things over with the big guy. I'm sure he'll understand. I'm telling you: don't bring that sword back to Clavicus. It'll ruin him, I'm sure. I mean, not completely: He's still a Daedra Prince and all that. Look, keep the sword if you want. That's your decision. But don't give it back to Clavicus. He doesn't know what's good for him sometimes. You would break our bargain? You dare to trifle with me? Take care, mortal. Clavicus Vile watches you now. And waits. You've brought the sword! Now give it to me, as we agreed. Umbra and I have unfinished business. Clavicus Vile's followers do not like you. You do not have a Daedric artifact to use for the Blood of the Daedra quest (although any of the other 14 artifacts can be used instead). Umbra ceases to be a quest item, in particular it is now 45 pounds in weight instead of 0. Clavicus will become outraged with you, but although he threatens you, there are no visible repercussions in-game. You would dare?!?! We had a bargain, little hero. You would risk my wrath for a pitiful little sword? I will be watching you mortal. And waiting. Whichever route you choose, this quest is officially complete, and you are rid of Barbas. Keeping Umbra does not prevent you from doing Hermaeus Mora's quest. If you never killed Umbra, it is now possible to return to Vindasel, kill her, and get the sword. The advantage is that the sword is now a permanent quest item, with zero weight. The disadvantages are that you can't do this until after level 20 and that you can never drop the sword. Barbas will now finally leave your inventory, but not without a few last words. Oh, well. Been good knowing you, kid. Back to being His Hound for me. As for you... good luck, I guess. I've met worse. Clavicus' dog, Barbas, may be Creeper from Morrowind. Listen to him when he talks about what he used to be. Among other things, he says, "For a while I was a scamp, making deals with Orcs." If you wish to achieve 100% completion, you must return the sword Umbra to Clavicus. This is the only way to obtain the Masque of Clavicus Vile, which is one of the 15 items that count towards the "Artifacts Found" statistic. It is possible to complete this quest without killing Umbra by disintegrating the sword and then pickpocketing it. The greatest challenge in defeating Umbra lies within her healing ability: damage has to be done as rapidly as possible so that she does not just heal herself in between your attacks. The sword and her armor are both very powerful; having them in your possession early in the game is a great advantage. It bypasses a serious glitch that occurs in unpatched versions of the game. You can complete the quest well before level 20, and avoid paying the 500 gold offering. If you approach the Shrine at any time with Umbra already in your possession, you can trigger the entire end-of-quest dialogue and the quest will be marked as done. Just be sure to talk to Ma'Raska first to make sure the quest updates properly. This is the only way to obtain a Daedric artifact for the Blood of the Daedra quest at level 1, and therefore it allows you to complete the Main Quest at level 1. 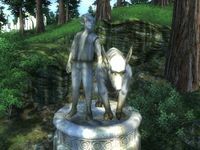 This bug is fixed by version 1.1.511 of the Official Oblivion Patch. You can keep Umbra forever, and never return to talk to Clavicus Vile. The quest will remain forever "active" in your journal. Also, you will be unable to complete Hermaeus Mora's quest. You can get Umbra before Clavicus Vile ever gives you the quest, and thus prevent the dog statue from ever appearing in your inventory. Be sure to first talk to Ma'Raska at Clavicus Vile's shrine, causing the quest to update, telling you that you've found the sword and can speak to Clavicus Vile. Talk to the shrine and the quest will be completed without any glitches. Note that in this case killing Umbra counts as murder. On the other hand, you do not have to pay the 500 gold offering. This way, you can also finish the quest before you even reach level 20. Other workarounds are less reliable and require very good timing. Return to Clavicus Vile's shrine with Umbra and the dog statuette and talk to Clavicus Vile. As soon as he finishes talking you need to immediately fast travel somewhere else. When Barbas starts to talk to you, open your journal. The timing is critical; it must be as soon as he starts talking. If you go to your menu too early, the game will crash when you exit; if you press it too late the game will already be frozen. It helps if you activate the game's subtitles, and activate your map as soon as they appear. Repeatedly fast traveling has also been reported to work: as soon as the screen loads, open your journal and fast-travel again. Be sure to fast-travel to a location where you will not encounter enemies (so that you can fast-travel again immediately). Fast-travel repeatedly until the notification area in the corner of the screen tells you that the Statuette of a Dog has been removed. Note that if you attempt the repeated fast traveling method, there is still a possibility that the game will crash when you have traveled a certain number of times. The final possible workaround is to load an earlier saved game from before you started this quest, and retrieve Umbra before speaking to Clavicus Vile. 20 When I gave my offering at the Shrine of Clavicus Vile, the Daedra Lord told me about Umbra, and how he wishes me to return to him the Umbra Sword. I should start my search in Pell's Gate. 30 Barbas, the Hound of Clavicus Vile, has spoken to me through the figurine that appeared in my pack. He tells me that returning the Umbra Sword to Clavicus Vile is a mistake, likely to cause great ruin to Vile's domain. 40 I've been told that Umbra was once a resident of Pell's Gate, but now has left. Some claim to have seen her recently near the Vindasel Ruins. 45 I have met the one called Umbra and been offered a choice: stay and fight, or leave in peace. 47 I have chosen to leave Umbra in peace. I should return to the Shrine of Clavicus Vile and make my decision known to the Daedra Lord. 50 I have retrieved the Umbra Sword. 100 Finishes quest Clavicus Vile appreciated my efforts. He has taken the Umbra Sword and rewarded me with the Masque of Clavicus Vile. 105 Finishes quest Clavicus Vile was not pleased that I elected not to return to him the Umbra Sword. Stages are not always in order of progress. This is usually the case with quests that have multiple possible outcomes or quests where certain tasks may be done in random order. If an entry is marked as "Finishes Quest" it means the quest disappears from the Active Quest list, but you may still receive new entries for that quest. It is possible to use the console to advance through the quest by entering setstage DAClavicusVile stage, where stage is the number of the stage you wish to complete. It is not possible to un-complete (i.e. go back) quest stages. See SetStage for more information. This page was last modified on 12 April 2017, at 05:50.